Expandable waistband. 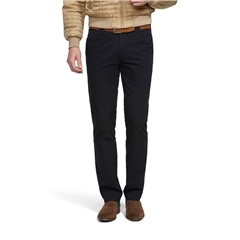 This trouser has two hidden elastic inserts on the waistband for maximum comfort. MEYER is one of Europe´s leading specialists for men´s trousers. Founded in 1960 in Waldbröl, in the Bergisches Land region of Germany, the Meyer trousers family business now enjoys the trust of more than 3,500 supplier partners worldwide. This success story of Meyer trousers is based on a consistent standard: quality down to the smallest detail of every pair of Meyer quality trousers! High–quality materials, the excellent Meyer fit and functional details are what make Meyer trousers so special. Meyer's many years of experience and confident sense of style and design are now being used to develop the collections in Reichshof–Denklingen area of Germany. Meyer's goal is to fulfill their quality promise in every detail. Therefore Meyer exclusively use high–quality materials such as pure virgin wool, the finest cotton and airy kapok. Meyer currently delivers its excellent men's trousers to 35 countries worldwide.